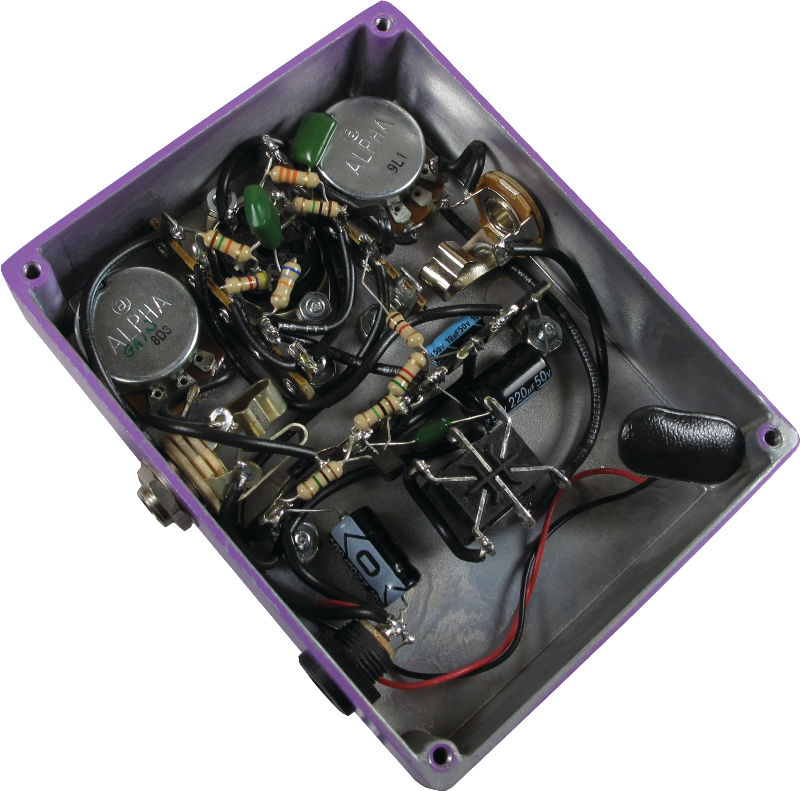 Build your own tube preamp pedal built around a 12AX7 tube. Go from clean, warm tone to smooth, real tube overdrive. This kit includes pre-drilled die-cast aluminum enclosure and all parts with easy to follow instructions. All you need to provide is solder and soldering iron. The Persuader allows for easy access to the tube, giving you the ability to quickly experiment with different tube brands and 12AX7 tube relatives. Packaging Dimensions 8.4 in. x 6.1 in. x 1.5 in. 1 answers Does it come with the enclosure and tube? Yes, this kit will include the tube and enclosure. 1 answers Can I put a 12au7 vacuum tube in the Persuader or must it always be a 12ax7? And can I build this without the 9 volt battery option and only use the power supply for power. Thanks in advance. 1 answers How long does the battery last? I plan on using it for my acoustic to warm up the sound. Gigs usually 2-3 hours. thx! The battery will last about a half and hour. This includes the time when the pedal is not engaged. 1 answers Is there a way to modify to get more gain? Please contact MOD Kits at: info@modkitsdiy.com for more information on mods to this kit. 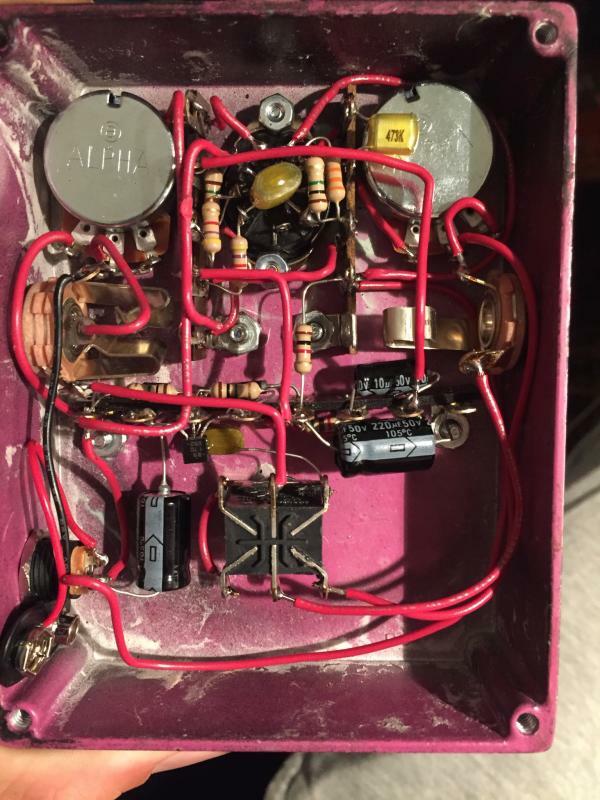 1 answers Can I modify this pedal for more distortion? 1 answers What gauge wire does this unit use? These kits use 22 AWG wire. 1 answers Hi! Is this pedal is recommended for bass guitar? Yes we recommend this for bass and it sound great! 1 answers Is this the same as the deluxe minus the extra tubes? The deluxe has an LED and a mini-toggled boost switch located at the top of the pedal. 1 answers What is the current draw of the pedal? Want to know if I can run it off my pedal board, or does it need a stand alone power supply. This pedal runs at about ~125mA. 1 answers I am seeing 6.5 volts DC at test point F (Tube Pin 7 (grid)). I cant see any wiring mistakes. Any suggestions? Please contact info@modkitsdiy.com for troubleshooting tips. Worth every penny, instructions make the build easy, Also backs as a 12ax7 tube tester! This pedal can also be used as a booster pedal on the low settings. The sound clip does not do this pedal justice, has that distorted warm tube sound, quality parts, buy it! 1. I didn't learn anything about how effects pedals work or what each individual component provided in the kit was for. All I learned was how to follow the assembly instructions, which are very well written and easy to follow. I guess I expected, this component is the first gain stage, sort of tutoring. 2. My pedal checks out on the test points with the correct voltages etc, but my pedal does not at all produce the results found in the sound sample. My volume pot works fine but does not increase volume beyond that of the amps boost function. The gain pot hardly works at all not engaging until max setting. The gain obtained from the pedal is much less than the gain from the gain channel. 3. there is really no way provided to check results as assembly is taking place. The trouble shooting procedures are not in depth enough to be of any real use. For example, what do you do when your voltage is high on tube pin 7? This was a good experience and I am glad I tried this. It made me realize I would likely not enjoy building my own amp from a kit as, I would end up with an amp I already have and there is no real pleasure in wiring a tube socket or tinning the ends of hundreds of wires required to build an amp. 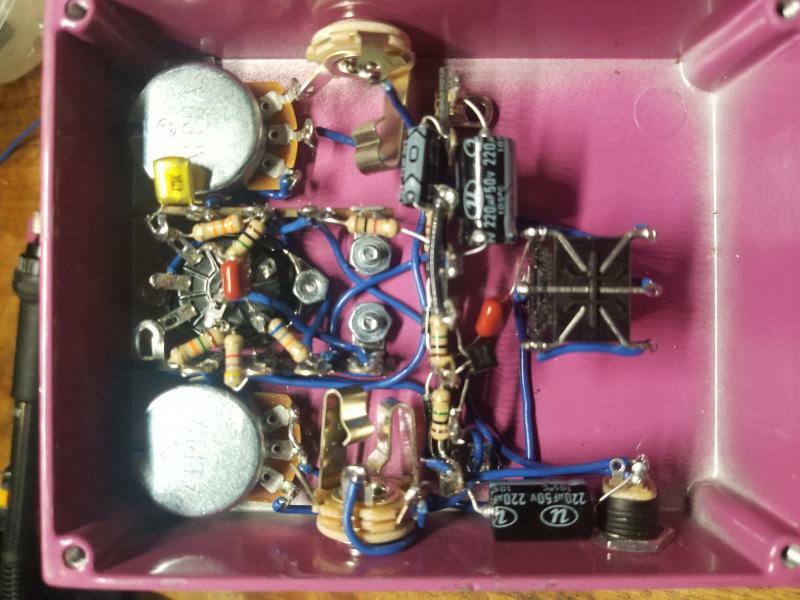 If this is your first effects pedal build then sort the kits low to high in price and choose the least expensive kit with the fewest components as your first kit. Also choose a pedal carefully and get something your amp doesn't already do. Bought this recently as a tube overdrive for my bass. This being my first experience building a pedal myself, I didn't want to go overboard with too many extras. I printed out the colored version of the instructions from the MOD website which made it very easy to read and decipher. It is true what some people are saying about the grounding issues between the terminals and the pots. I solved this with two small strips of electrical tape for redundancy. The build was very comprehensive and took me about 2 1/2-3 hours to complete. I too had a little difficulty fitting the chinese tube into the socket, but after a little fiddling and pin adjustment it went right in. The tone on this pedal, for bass, is awesome. I get a nice fuzzy tone with the gain all the way up and warm break up with it set a little lower. The volume output is not quite as high as I'd like it, but perhaps a different tube will solve this issue. Three cheers to a fun build and a great pedal! As a avid DIYer and bass player I came across this site and immediately ordered the Persuader. After a few short evenings of soldering and assembling I was ready to test it out only to find that i wasnt getting any of the tube effect at all. One email to customer service pointed me in the right direction for troubleshooting and ended up having a bad mosfet which they promptly sent to me for free! Not only did I increase my soldering and wiring capabilities and get to troubleshoot a minor problem but now i am left with a totally KICK A$$ pedal that ROCKs! Also i picked up a few new tubes to modify the sound: jj803-s, sovtek LPS, and tubestore preferred series. So far the JJ long plate has the best break up for bass while the sovtek has a little to much break up, while the preferred series sounds good all around it fits a guitar sound better. I highly recommend this for anyone looking for that nice responsive beefy tube overdrive tone or if you are looking to smooth out your tone. It is worth the work and it is educational. I recommend getting a 12au7/ecc802, I got mine from JJ and it gives more rich overdrive tones. Amplified parts shipped it immediately, I ordered it late at night and received it the next day. This was my first DIY pedal built. I had fun making it. It has a versatile fuzz tone, lower the gain and you have a cleaner drive tone, crank the gain control and you have a thick tubby fuzz tone. 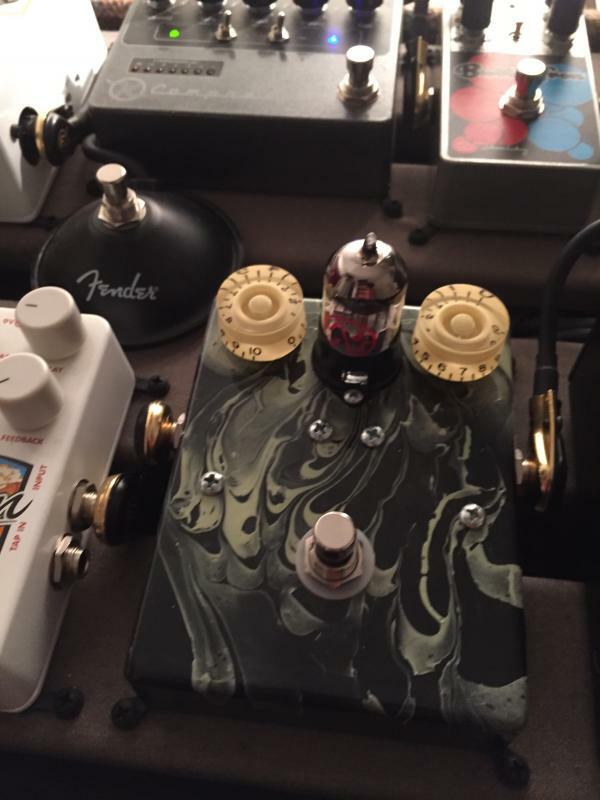 Great pedal for blues and classic rock. I will be posting my review on this great pedal on youtube. Read the instructions throughly. The main problem I had was grounding problem, the two terminal strips along both sides of the 9 pin tube socket were touching both volume, gain pots and the tube socket base bracket. The spaces between these areas are so tight and can easily be shorted. The instructions pointed this out. Great fun to build this Pedal. A drawback is the gain pot, which does some nois while turning the knob. Very Cool Overdrive. Very easy build. The instructions are clear and detailed. All in all, you get a very nice end product for the $! Chassis Cage - Hammond, Steel, 10" x 6" x 5.2"